Creating new value from a strategic and long-term perspective to meet the expectations of all stakeholders while responding to the needs of society through our business activities. This is the CSR of the Happinet Group. Contributing to holding down "social energy consumption"* and costs associated with product distribution, while also providing greater efficiencies by functioning as an intermediate distributor positioned between manufacturers and dealers. As an intermediate distributor positioned between manufacturers and dealers, the Happinet Group purchases products such as toys, music and video media, game software, and vending-machine "capsule" toys from various manufacturers and delivers them to dealers and consumers around the country. Our goal is to offer added value for optimizing distribution as a whole. In other words, we aim to contribute to holding down social energy consumption and costs while providing greater efficiencies, thereby improving productivity across the entire supply chain (distribution). See Figure 1 below. * "Social energy consumption" refers to the various forms of energy-including electricity, gas, and gasoline-that the Happinet Group consumes in the course of carrying out its business activities. 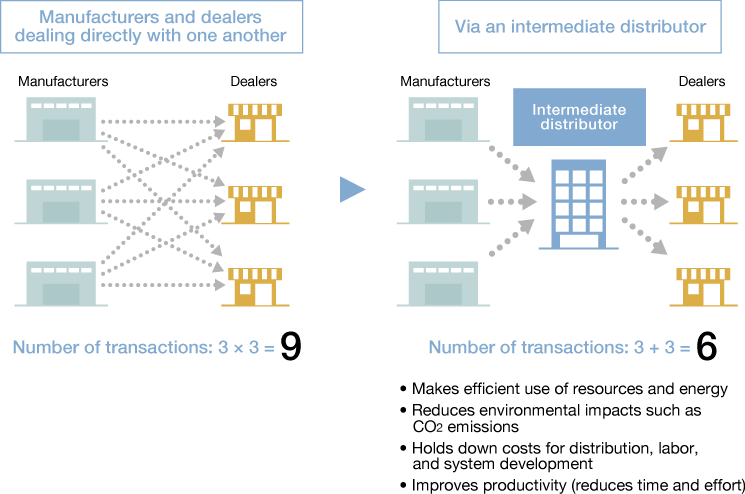 As shown in the illustration on the left in Figure 1, when manufacturers and dealers deal directly with one another, the total number of transactions (units of activity in which goods are delivered or information disseminated for a certain purpose) associated with product distribution is "9". 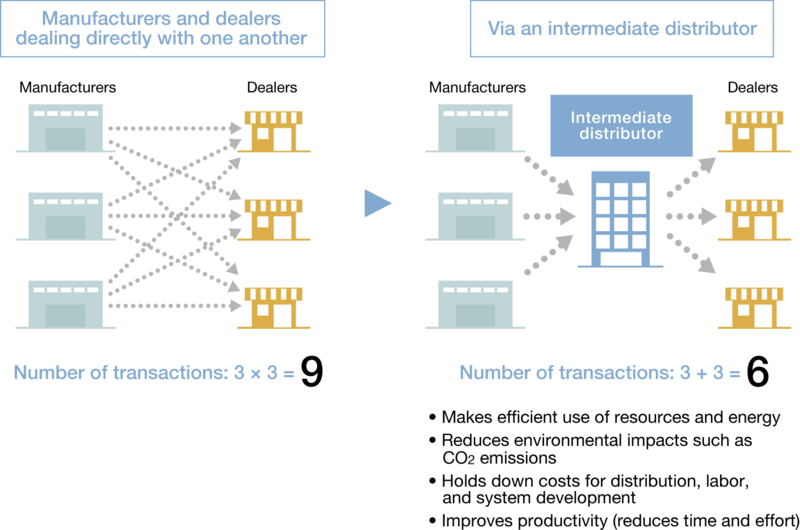 But as shown in the illustration on the right, when the Happinet Group provides its intermediate distribution service-which consolidates goods for batch delivery or collects and disseminates information in batches-the number of transactions totals only "6". This reduction in transactions makes it possible to cut energy, labor, and other costs required for logistics and information processing, while at the same time reducing CO2 emissions. This effect is multiplied as the number of manufacturers, dealers, and items handled increases. In this way, we meet the needs of society through our core business, while also meeting the expectations of our various stakeholders involved in this business by working from a strategic and long-term perspective. We will develop the optimal distribution system-one that is valued by all of our stakeholders-while providing the ideal solution to the needs of manufacturers and dealers. With a view to supplying a large amount of goods and information on a timely basis and fulfilling our social mission as an intermediate distributor-in other words, optimizing the entire supply chain (distribution)-the Happinet Group has positioned three systems as the foundation of its business: sales support, logistics, and information systems. Happinet will continue to refine and improve the individual functions of each of these systems. In addition, by integrating these three systems, we will develop an optimal distribution system for supplying goods and information that manufacturers and dealers require by optimizing the system to match changes in the market. Making use of this system will enable support for product manufacture and sales activities that can respond both to the market environment and to the particular supply/demand situation of each manufacturer or dealer. In addition, distribution channels as a whole can be made even more efficient, further enhancing the effect of holding down social energy consumption and costs. This optimal distribution system has been constructed based on the concept that multiplying the functions of these three sales support, logistics, and information systems will yield a result, and if any one of them is zero, the net result is also zero. Fulfillment of the Happinet Group's CSR-achieved by strengthening our core business-will enable us to further expand our circle of "happiness networking" and grow sustainably with our many business partners and employees, as well as with society. We will continue to realize our vision of inspiring individuals and building a future full of dreams.